Let’s face it, garages can be a catch-all for yard equipment, home maintenance tools and seasonal decorations. 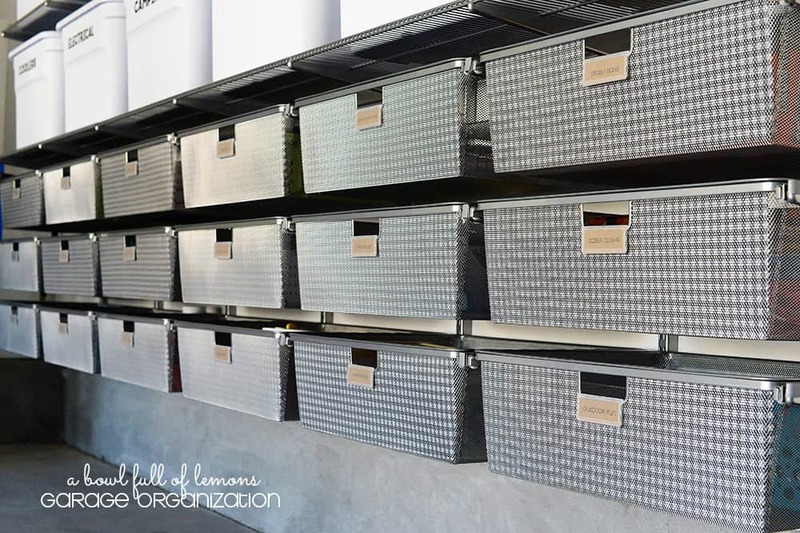 Garage organization ideas for keeping your garage organized can be a real challenge, but it does not have to be that way. Today, there are many garage solutions that can make organizing your garage easy. Most of the big box stores offer reasonable priced systems for organizing your garage that you can install in a weekend. There are also companies that offer garage systems that are installed complete by the manufacturer. Getting your garage in order is easier than you think. It is just a matter of selecting the solution that works best for you and getting started. 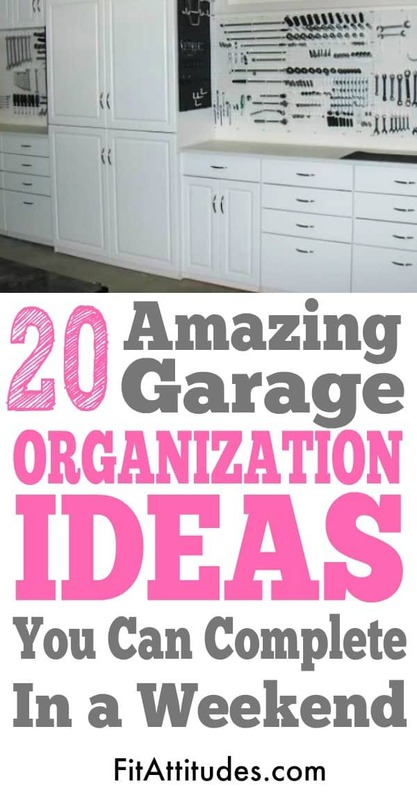 Here are 20 garage organization ideas that you can implement in a weekend. How often do you go out to your breaker box looking for a particular circuit breaker and can’t find it. Especially if you live in an older home this can be a problem. 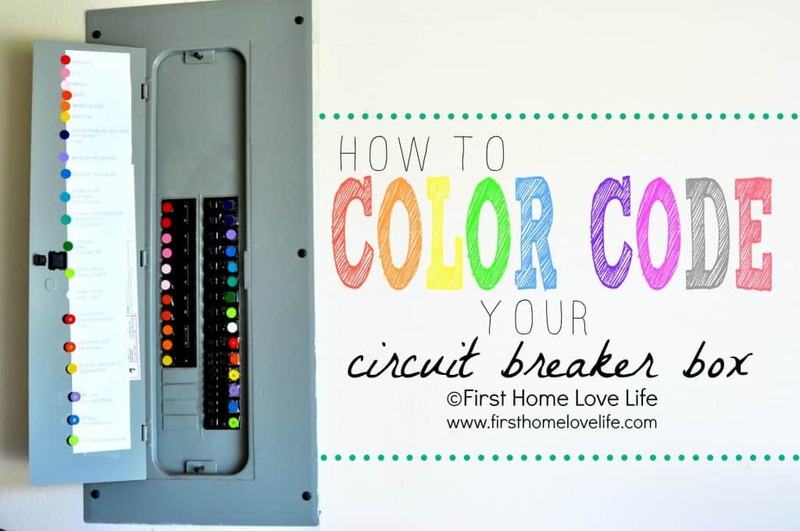 Color coding is the perfect solution to knowing exactly which switch goes to which circuit. This may take the help of an electrician, but it will be worth it when the lights go out. A simple circle hole punch and some paint chips will have you well on your way to having a map for your circuit breaker box. Do you have a garage with studs? If so, this is the perfect solution for making use of that hard-to-use space and getting your garage under control. This design makes use of all the nukes an crannies in this style of garage and does a great job of finding a place for all the sporting equipment that an active family owns. Scrap wood and 2 x 4s and basic hardware will get started on this project. This garage organizations project does a great job of making use space. 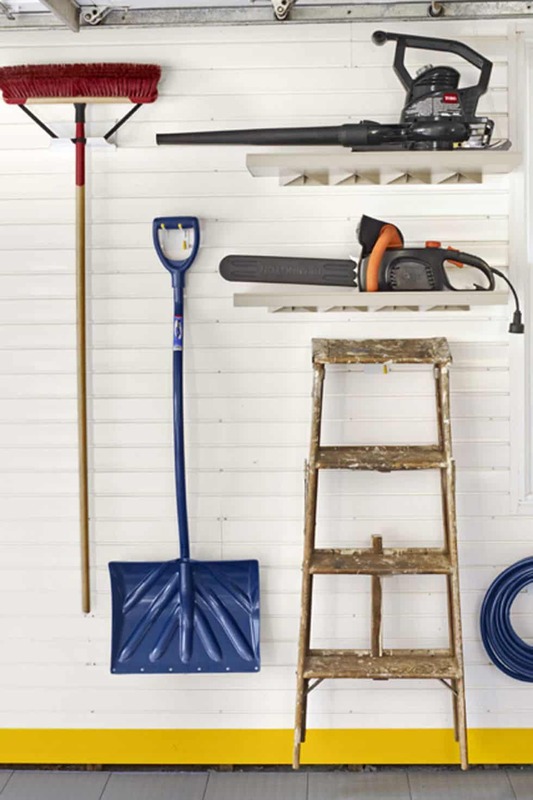 A garage has more space for storing items than you may first realize. There are several companies that make great systems for purchase that will store any item you can imagine. There are also very economical ways of accomplishing the same storage solutions. 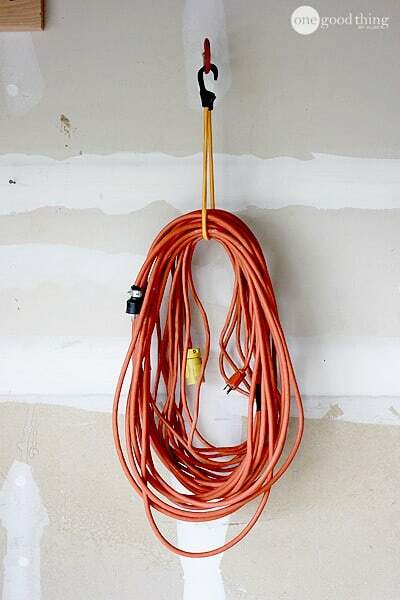 Check out this great cost saving method for dealing with long and bulky extensions cords. The same hook and bungy cord system can work for many other items that need a garage storage solution. This hack can have you organized in less than an hour. If like a clean and neat look, you are going to love this garage system. 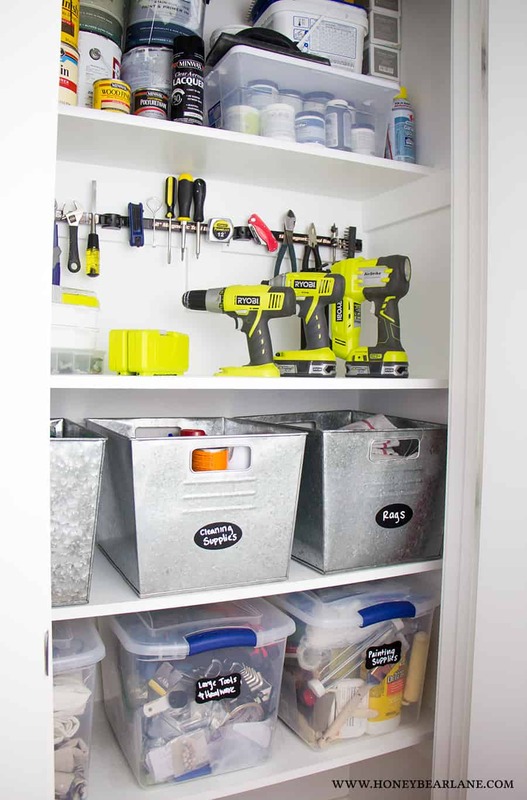 All the items for this garage organization system can be purchased at the container store. This system can be installed in a weekend having you garage storage looking like it was created by a designer. You will never have to search for items again with this shelving system. Keeping your outdoor space beautiful requires maintenance tools and these tools can become out of control if you don’t have a system for keeping them organized. 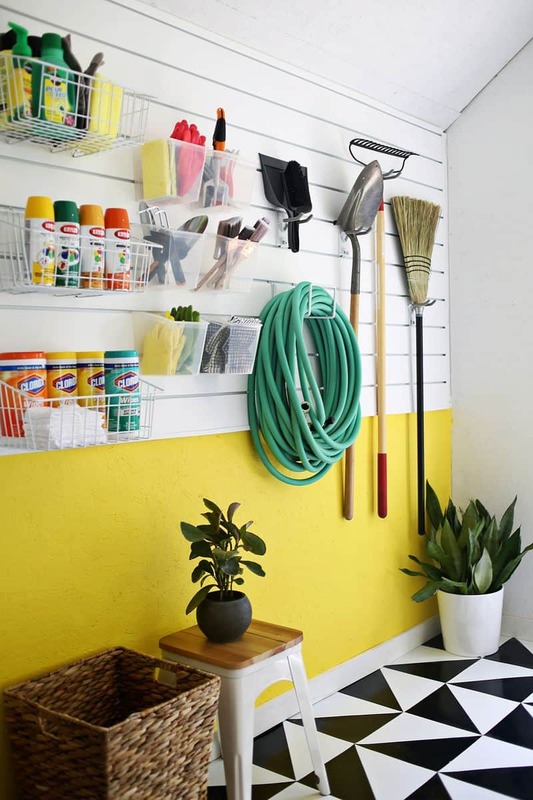 This bright and colorful wall system can keep your basic gardening and cleaning products organized and within easy reach. Martha Stewart Easy Living provides all the pieces required to get this system up and running quickly. Enjoy working in the yard, but hate having the tools laying around? This cute wall system will make sure you never have that problem again. How often do you look for fresh batteries to replace the ones that have died in your “can’t live without device”? You find the batteries and then you wonder if they are really good. Or you have replaced the batteries in you device, but what do you do with them? 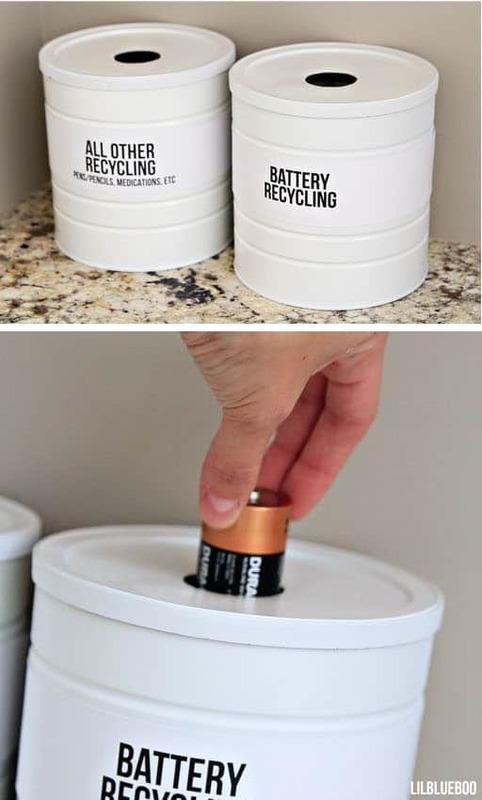 This battery recycling station will keep your used batteries ready for recycling. It is as simple as taking empty coffee cans, painting them and cutting a hole in the top. You have just finished painting your favorite room and you have half a can of paint left. What do you do with it? you would like to get rid of it, but what happens if you need some for touch up? 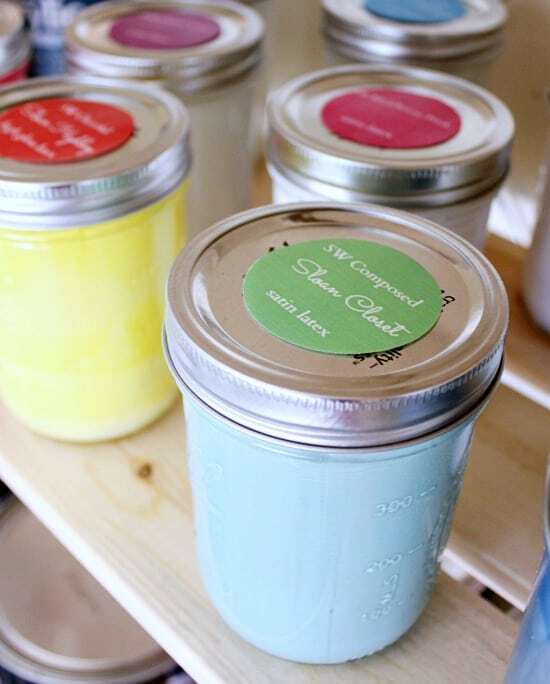 This simple idea for saving touch up paint will save you space and give you the paint you need. Get some mason jars or make use of glass jars that you would have disposed of anyway. No more nasty looking paint cans littering up the garage! Are you looking for a garage organization solution that gives you a lot of versatility? This homeowner designed their system around their needs. What can you get rid of? What do have left that needs a space? 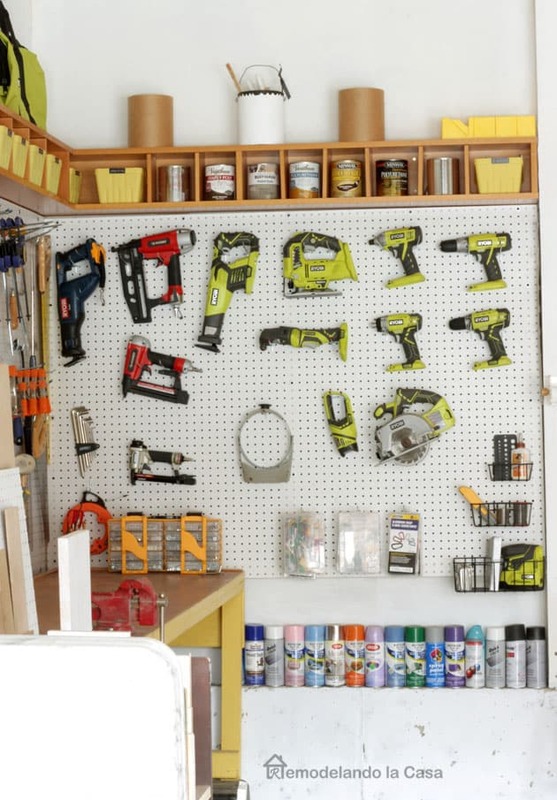 This reorganization has a many small spaces that will accommodate maintenance tools as needed by putting them on shelves and hooks on the wall. Having clear floor space to walk and move around is the best thing about an organized garage. If you are an avid gardener, you will these simple ideas for getting your garden shed in order. If you only dream of having a garden shed, your garage can fill the bill. Have fun creating the perfect “garden look” with these cute storage containers for any shelf or table. 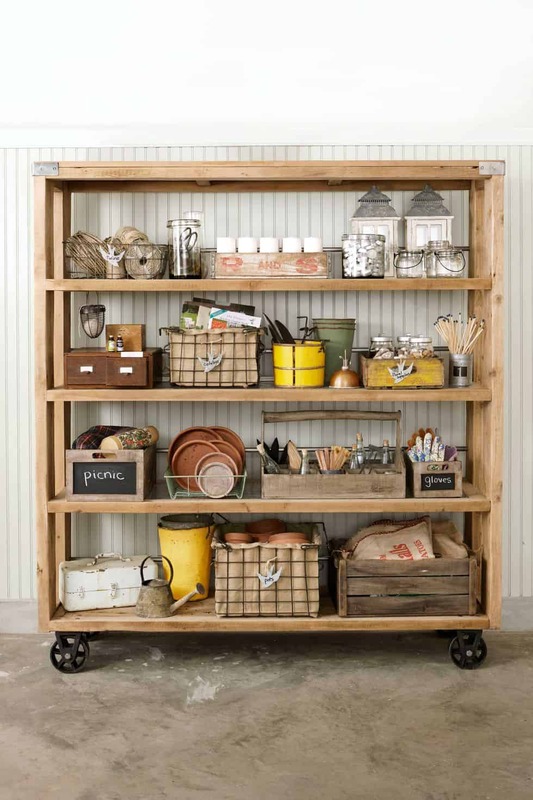 Create the perfect area for making a beautiful outdoor space with these organizing ideas. Are looking for a solution that can fit almost any garage storage need? Why not check out Monkey Bar Storage? Find shelves, cabinets, flooring, overhead storage, small items and workbench solutions. This is a great option if you like a coordinated system. Monkey Bar Storage is the perfect solution for building garage organization to meet your needs. Do you need more room in your garage to store things? This is a storage solution for your lighter weight items. It can come in very handy when it comes to storing holiday decorations and clothes. You know that unused space above your garage door? Create this inexpensive system in a day with basic supplies from your local hope improvement store. Now you can get those cardboard boxes out of garage and enjoy clear floor space. 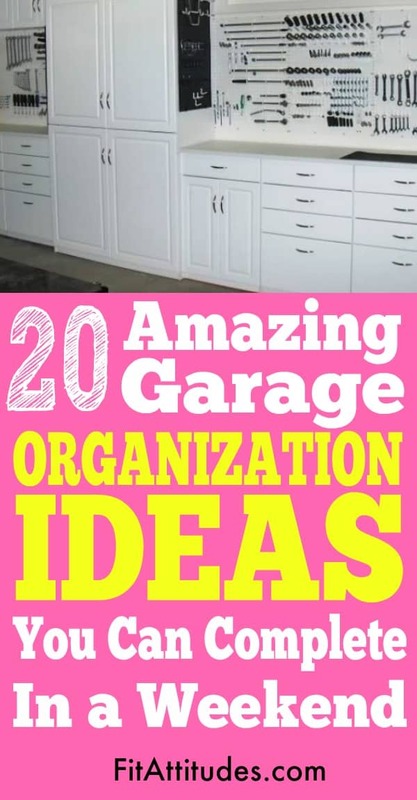 It is fabulous to see a garage organization plan that has everything in place, all containers looking the same and everything looking coordinated. But truth be told, most garage solutions probably look somewhat like this one by The Kim Six Fix. 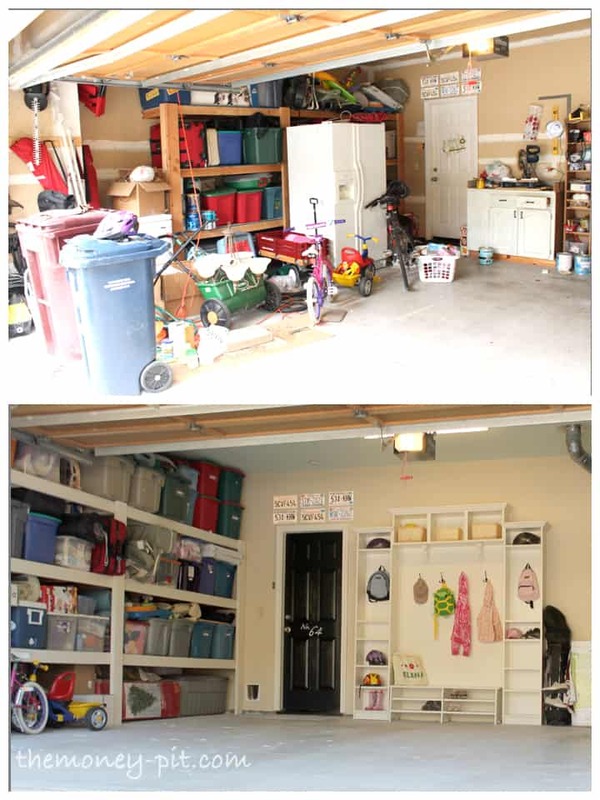 They do a great job of documenting step by step the solution they came up to organize a very full garage. As long as you plan and consider your needs, garage reorganization solutions can be very inexpensive. Power tools have become a standard item in most homes today. Keeping them neat and orderly when you have 10 or 20 can be a challenge. The idea originated through the Heathered Nest and boy is genius. The main components are a wire shelf and hardware, nylon cable ties and PVC pipe. 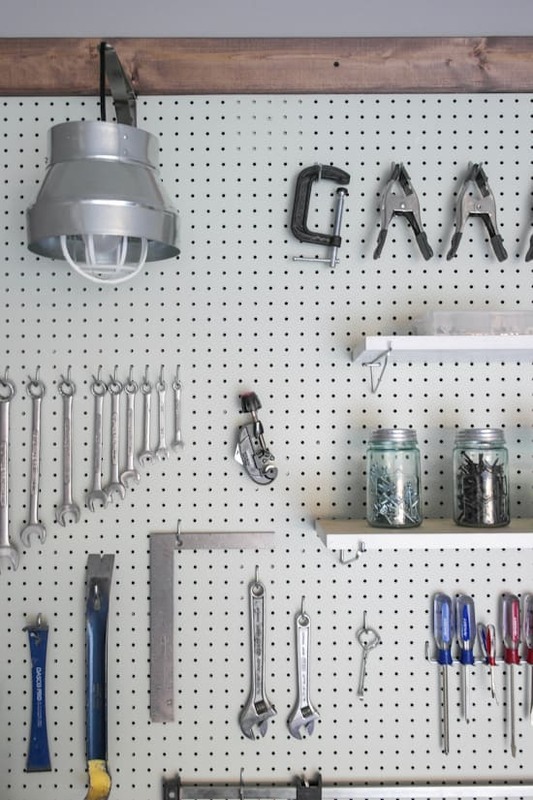 Keep your tools organized with this garage tool organizer that can be made in a few hours. 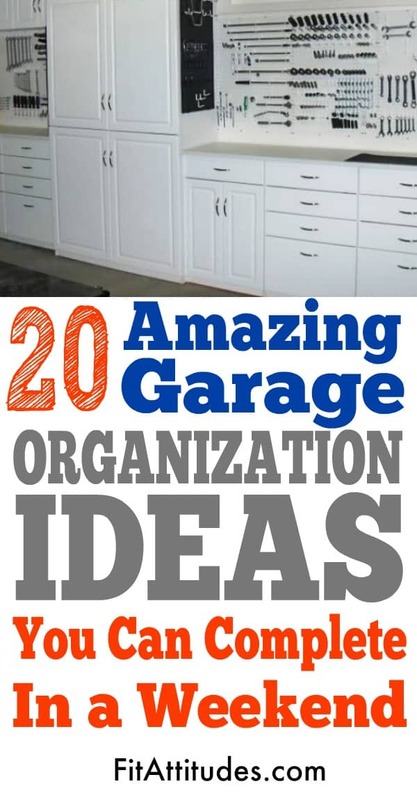 Need a new look and organization system in your garage? This garage makeover mixes functionality and beauty in the same space. This space has shelving, wall space organization of tools and cabinet space. In addition, there is a mud room areas that allows for easy removal of shoes with coats for hanging coats. The decorative lanterns with candles are the perfect finish to this multifunctional garage organization project. Do like to fish, but have a hard time keeping your fishing poles organized? This simple, cost effective idea will keep all of your fishing poles in order with little effort. 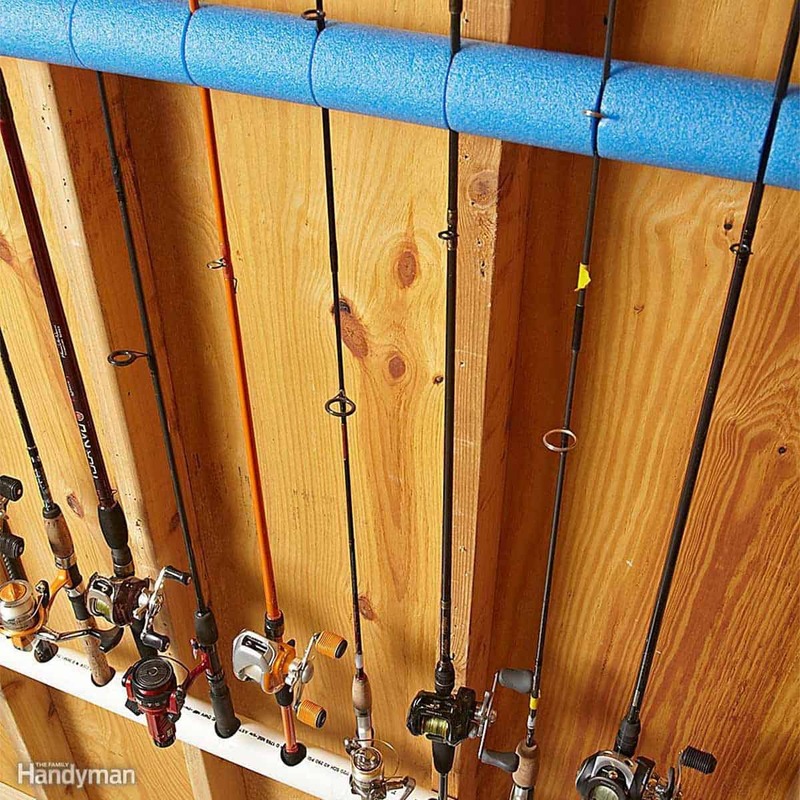 PVC pipe and a swimming pool noodle are pretty much all it takes to create this handy fishing pole storage unit. No more tangles with this easy to install fishing pole holder! Storage solutions have come a long way. It used to be peg boards were pretty much for function. Now, not only are they functional, but they can be part of your room decor. This peg board is stylish enough it could be used in a craft room to hold tools and other craft items. The possibilities with a peg boards are endless. Are you tired of that container of small tools? Pick out a peg board and hang them in an organized fashion and never have clutter again. 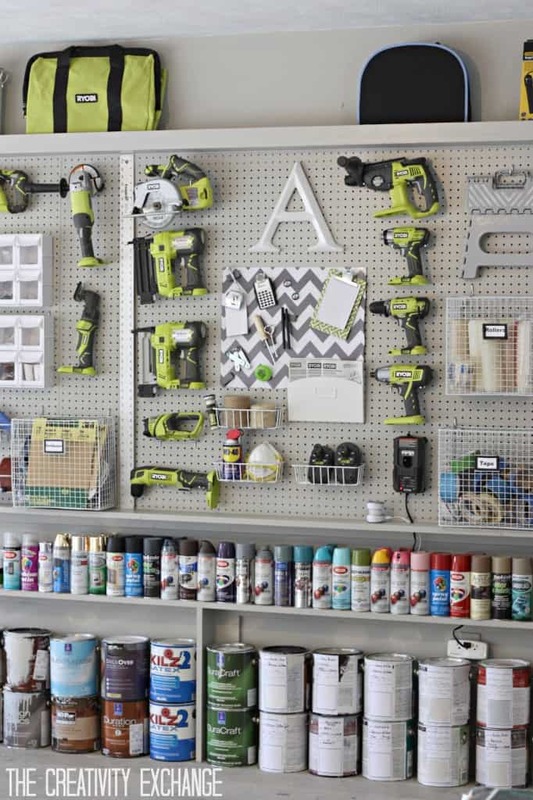 If you are redoing your garage, no makeover is complete without a peg board. Peg boards are a great way to store small items that are used frequently. If you want to make sure everything is returned to its proper sport, outline each item while in place and you will always know where it should be returned to after each use. 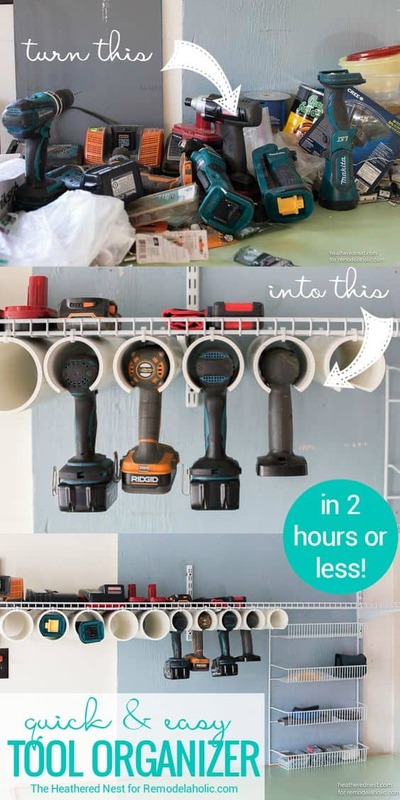 No more clutter of screwdrivers and wrenches with this garage peg board storage solution! Would a simple work bench be a good fit for your garage, but the amount of space you have is limited? No worries. This easy-to-make table folds down requiring just a minimal amount of space. This bench offers a sturdy place for all your shop chores, and folds down flat against the wall when not in use to save space. Complete you garage or craft room with this functional drop down table. 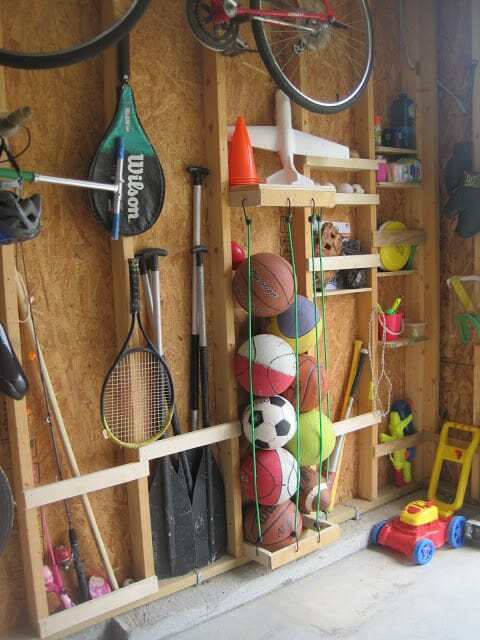 Reorganizing and creating storage in your garage does not have to be complicated or expensive. This simple shelf unit is the foundation for this system. Galvanized bins and large clear plastic bins are hold most of the items in this garage. Like items are place together organizing the space. A magnet strip provides the perfect tool for holding the smaller often used items that you need within arms reach. 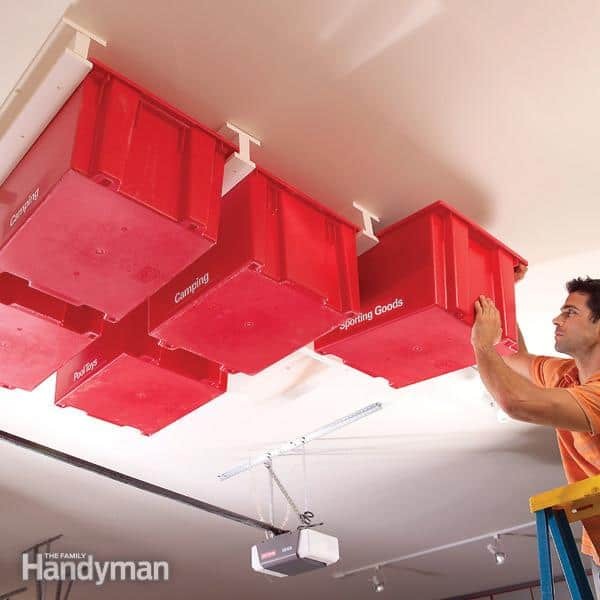 This garage solution is very basic…shelves with totes. The looks is clean and uniform. This article not only tells you how to install the shelving unit, but the homeowner explains the planning process. If you need a lot of easy to access, out-of-site storage using these shelves and closed containers make a great option for holding all of your stuff. This garage shelf unit was constructed with silver Closet Maid Shelving. 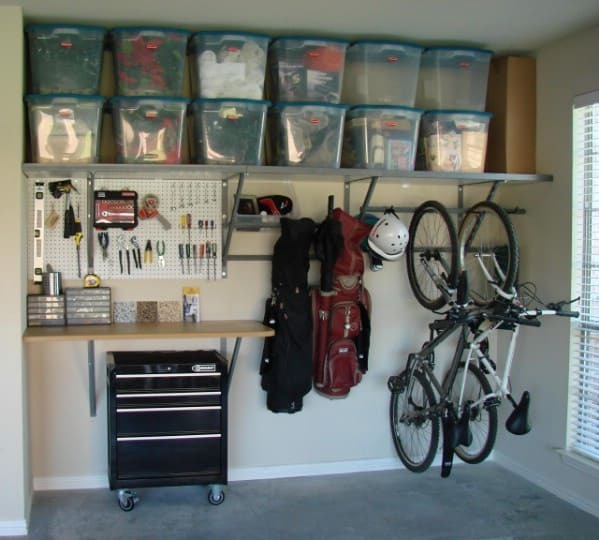 Garage organization can be as simple or as detailed as your garage and its contents require. Look at what you have to store and the space you have available and make a plan. Do you need a mud room area? A gardening area? Or will some simple shelves and bins do the trick? Many garage reorganizations can be done in a weekend. Get out a piece of paper and sketch out a plan to reorganize your garage!